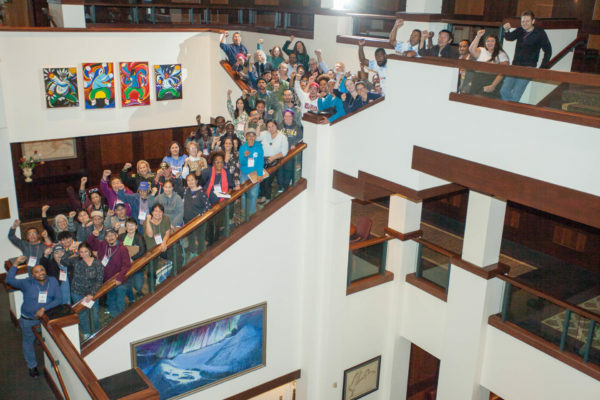 First People from around the world meeting at Girdwood Alaska to discuss alternatives for those Indigenous people who live along the coast of oceans and seas displaced by climate changes. During the First Peoples Convening on Climate-Forced Displacement, which brought together over sixty First and Indigenous Peoples from various regions of the world, participants identified ‘loss of culture and traditional practices’ as one of the biggest risks they are faced with due to the ongoing threats of climate induced environmental hazards. From the Alaska Native Villages along the Bering Sea to the Tribal Nations in the Bayou region and the Oceanic Islands of the Pacific, each participant recognized the interconnectedness of land, home, culture, spirituality, language and subsistence and how this inherent bond, which is a crucial part of their identity as First and Indigenous Peoples, is being eroded due to rising seas, melting permafrost, ongoing erosion and intensifying droughts and storms. As a funder who is focused on supporting and centering First and Indigenous Peoples in addressing climate forced displacement, its impacts and responses, we were privileged to learn about the various dimensions of how Indigenous values were being affected. The recognition that language was not a stand-alone issue but a critical part of the cultural survival of First and Indigenous Peoples was a crucial lesson. We also wondered how climate change and forced displacement would further impact the losses communities were identifying, and how those experiences would or were shaping their responses, particularly given the historical legacies of colonialism, wars, conflict and forced relocation that most communities in the room had experienced and were still reeling from. Indeed, many communities recognized that loss of language is not new but that climate change impacts and forced displacement would further exacerbate and accelerate this loss. In Alaska for instance, recognition of the loss of Alaska Native language is more widespread across the State. In its 2018 biennial report, the Alaska Native Language and Preservation Society recognized that Alaska Native languages are in a linguistic emergency and called on the State to make state policy to promote and develop those languages through public education in schools; supporting the use of Alaska Native names of State-supported projects and signage; and by recognizing the State’s role in forbidding and suppressing Alaska Native language in village schools and boarding schools across the State. While State level intervention is critical, communities identified the need for more intentional engagement between elders in their communities and youths to help them re-learn their languages as well as traditional ways of living with the land and adapting to the changes happening to their homes. It was important for communities to communicate the changes that they were experiencing through their own language and through their own stories. 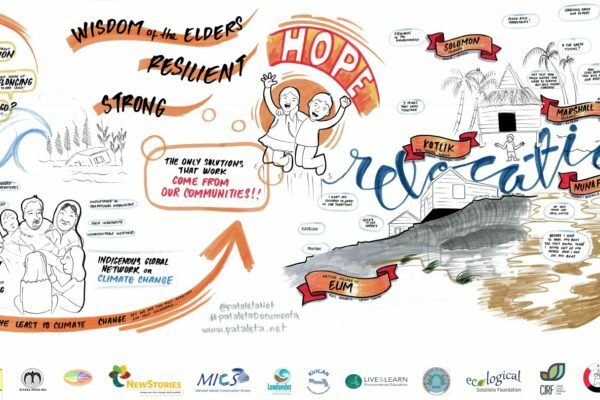 Participants recognized how climate change impacts were increasing health and safety risks on its most vulnerable populations, including elders who are traditional holders of knowledge and wisdom and that elders were passing away. Participants raised the importance of and the need to document and record elder knowledge and wisdom to help current and future generations to not only adapt to climate change but to also guide them in their plans to relocate. There was also recognition that many young people were living in or moving into urban centers for further education and jobs where English is the first language. Indigenous language is also important in documenting the hazards that Indigenous communities are facing on the ground. 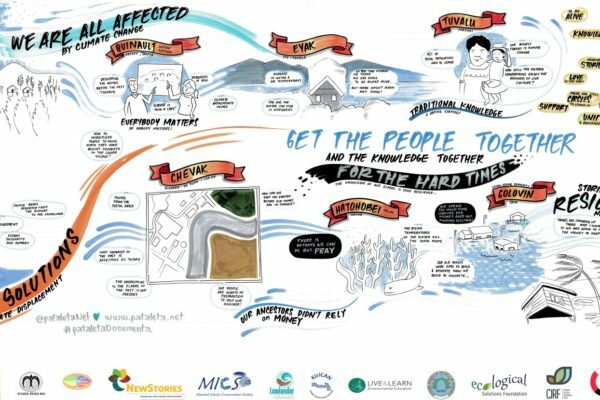 In 2018, our partner in Alaska worked collaboratively with multiple stakeholders including Yu’pik linguists, state and federal agencies, and researchers to come up with the Yu’pik word ‘usteq’ meaning catastrophic land collapse triggered by the combination of thawing permafrost, erosion, and flooding, which Alaska Native communities are facing as a result of climate change impacts. This is a new term that is now included in the hazards profile of the 2018 Alaska State Hazard Mitigation Plan, which will provide Alaska Native communities with the tool they need to document and garner state awareness and resources to help them address these issues. What do these various dimensions of Indigenous language mean to how we support First and Indigenous Peoples as they are being forced from their homes due to climate change impacts? Bringing together First and Indigenous Peoples from various regions was a critical first step in informing our work. Funders should support more cross-cultural, indigenous-led gatherings and sharing as part of learning how best to invest in climate justice issues. We learnt that convening First and Indigenous Peoples from around the world who speak distinct linguistic dialects was difficult. Consulting with Indigenous leaders throughout the planning process was critical in addressing this issue. Funders must work with Indigenous leaders to come up with innovative and practical ways of information sharing and story-telling. Funders should increase investments in Indigenous ways of living, Indigenous-led resistance, strengthening Tribal governance and in supporting Indigenous elder and youth relations. These are all critical components in helping them shape their responses to climate-forced displacement. In line with Article 16 of the United Nations Declaration of Indigenous Peoples, funders should invest in the development of indigenous media as a way of preserving indigenous languages to give visibility to their struggles and keep communities together, both in terms of artistic expressions and news media. UUSC is honored to be learning from First and Indigenous Peoples in all our work and we encourage other funders to do the same.